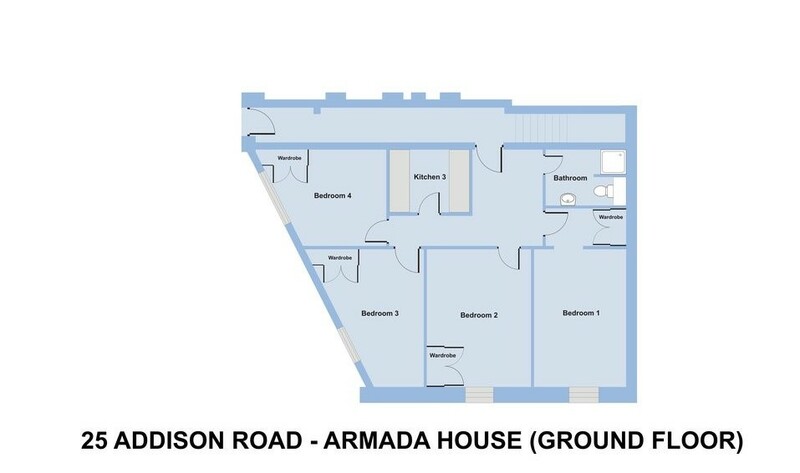 Although this is listed as a 4 bedroom property, please be aware that this ‘apartment’ is part of a larger 15 bedroom student house. This would be perfect for 4 friends sharing who want their own personal space when it counts, but love being part of a larger group too… Enjoy the huge shared lounge with Sky movies and sport, socialize in the larger kitchens, but know you can escape to your own private space when you want to! Rooms 1 – 4 are located on the ground floor of the property, offering self contained facilities away from the rest of the house. The ‘apartment’ has a communal kitchenette and contemporary shower room (with LED lit shelf) as well as 4 study bedrooms. The entrance to the apartment once inside Armada House is via it’s own, lockable door. An impressive house in an ideal location, and so convenient for the University of Plymouth and Plymouth Art College. This huge student home boasts 15 double bedrooms over 3 floors and is central to local bars, cafes and Plymouth City Centre, (which hosts lots of favourite stores, restaurants and other local amenities). The property can be found set back from the road in our own private complex. Rated ‘A Grade for Quality’ by the University of Plymouth Accommodation Services. 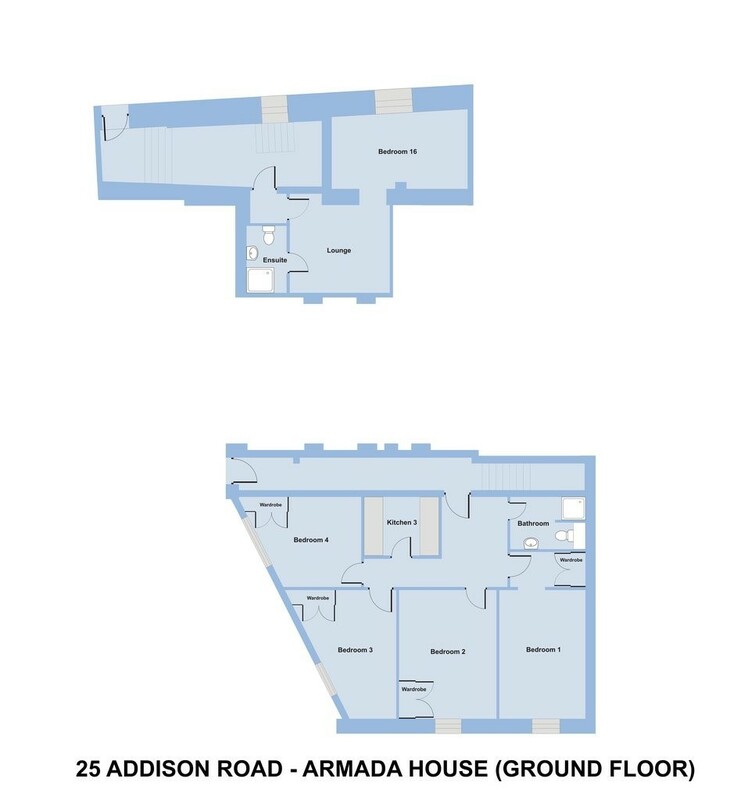 Armada House has a huge open plan communal lounge with laminate flooring, leather sofas, table tennis and dart board to boot! Also, there is a large, flat screen TV (Licence paid by us) including free SKY Sport and Movies, ideal for movie nights in! Both kitchens are extremely spacious offering further sociable dining, having been finished to a very high standard with light coloured units. There is also a large table and accompanying chairs in each kitchen. All our bedrooms in the apartment and through out the main house are of a generous size and include wash hand basins, double beds, built in wardrobes, desks and chairs. All tenants share the following facilities: 1 x shower room with WC, 1 x modern bathroom with bath, shower and WC, 1 x additional WC. The ground floor apartment has an additional washer/dryer and oven in the kitchenette plus a shower room with WC and wash hand basin. The Suite has it’s own shower room, WC and wash hand basin. Rooms ’11’, ’13’, ’14’ and ’15’ all have en-suite facilities. 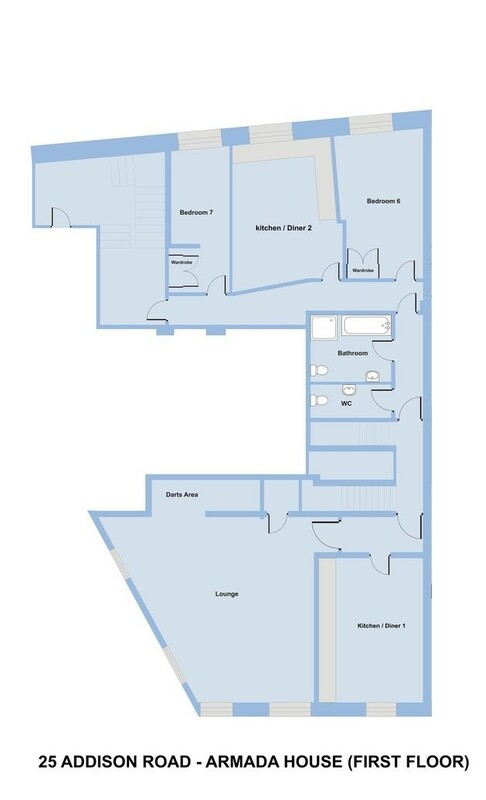 (Please see the floor plan link for a clearer view of the property layout). The property has CCTV cameras, phone lines and TV points to each study bedroom, along with gas central heating and double glazed windows. Secure parking spaces are also available at an additional cost. Our shared student homes are less than 250m from Plymouth University. Prices are inclusive of gas, electric, water (up to a usage cap of £10 per person, per week) and broadband (boasting the UK’s fastest available broadband with download speed of 350Mbps – business connections). We don’t require deposits, guarantors or administration fees, and offer individual tenancy agreements. Because we own and manage all our student properties, we have a vested interest in maintaining them to a high standard – as such our maintenance service is second to none! Don’t just take our word for it, take a look at our wonderful ‘Testimonials’ from our previous tenants on our webpage! 4 bedroom 'apartment' set within larger student house with shared use of all facilities!